I missed the live telecast of last Tuesday’s Lowell City Council meeting but I did watch a replay and posted my notes yesterday morning. Much of the meeting was about the funding crisis in this year’s Lowell School Department budget. School Committee members Jackie Doherty, Connie Martin, Andy Descoteaux and Gerry Nutter all urged the council to do what it could to avoid the substantial cuts that look to be required for the FY19 school budget. Councilors and City Manager Eileen Donoghue were all supportive in their comments, but were equally clear that finances on the city-side of the budget ledger will be extremely tight this year and offered little reason for optimism that additional funds will be allocated to the schools. One thing the council did do was to vote unanimously to send a council resolution to the state legislature urging that body to update the “foundation budget formula” that seriously underfunds urban school systems. That formula was put in place back in 1993 when education reform was first enacted, but has not been changed since. Another cause of concern with the budget is charter school reimbursement – or the lack of it from the state. Although they are governed my boards of trustees that are completely independent from the elected school committee, charter schools are public schools and receive public funding. That funding is based on the number of students from a community who attend the school, and a per-pupil amount of money goes from the traditional public schools to the charter schools. The legislature has deemed it equitable to reimburse the city at least part of this charter school allocation, but the reimbursement amount according to Lowell School Department officials (and City Manager Donoghue) has lagged far behind the amount needed to offset the money dedicated to the charter schools. Donoghue said that in the coming fiscal year, the city will pay charter schools $21 million beyond the amount reimbursed by the state. While everyone agreed that the foundation budget formula and the charter school reimbursement payments ought to be adjusted by the state legislature, everyone within the enclosure in the council chamber (i.e., the councilors and city manager) showed little inclination to divert additional funds to the traditional public schools. However, all agreed to hold a joint meeting of the finance subcommittees of the council and the school committee to work together on the various budget issues now in play. This coming Tuesday’s council meeting should be an interesting one based on the agenda that’s now available online. Among other things, the council will consider several ordinances related to the sale and use of marijuana, the possible banning of plastic bags by (some) retailers, and will act on a number of council motions related to rectifying the state’s “foundation budget” for the schools. Please check back here on Monday to see Mimi Parseghian’s City Council Preview which will explore these and other agenda items in greater detail. Those were the three topics discussed Thursday morning at the latest installment of the Lowell Plan’s Speaker Series. This event featured five graduates and one current member of Public Matters, a civic engagement and leadership program jointly conducted by the Lowell Plan and Lowell National Historical Park, who shared their perspectives on housing, new comers and civic engagement in Lowell. 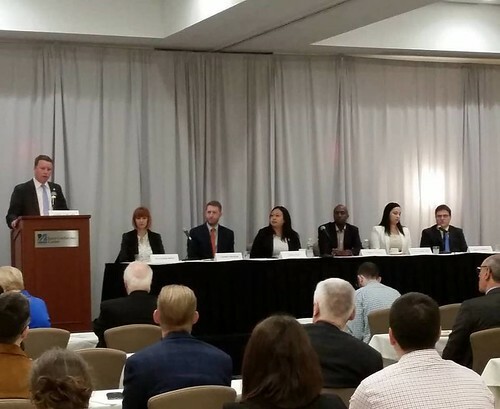 Speaking first on housing were Craig Thomas of Coalition for a Better Acre and Cathy Mercado of Santander Bank. Craig emphasized the concept of “housing first” which theorizes that you can’t solve other issues like health, employment and education unless people have a stable place to live every night. He then discussed the term “affordable housing” which he said carries a regrettable and unwarranted stigma. The Coalition for a Better Acre owns and operates a considerable amount of affordable housing. He said the median income for Lowell households is $50,000 (which means half the households in Lowell earn less than that each year). That same $50,000 is also the income limit for CBA housing. As Craig put it, three-quarters of the residents of CBA housing are employed. Cathy Mercado stressed the relative unaffordability of apartments in Lowell. To rent a two bedroom apartment in Lowell even with the help of a section 8 voucher, a tenant would have to earn $27 per hour in wages. She said that it is more affordable for someone to buy a $300,000 house in Lowell than it is to rent a 2 bedroom apartment. She praised Lowell for the availability of programs that provide down payment assistance, something that is critical to permitting working families to achieve home ownership. Craig said two trends are driving up the costs of homes and apartment rentals in Lowell. First is that Lowell has become fully integrated into the Boston market, with numerous people who work in Boston choosing to live in Lowell and commute either by rail or highway. This has increased demand and has driven up prices. Second is that a number of large, national investors are buying up small properties, even single family homes, and converting them to rental housing which tends to drive up rents across the city. The second team of panelists, Linda Sou of Lowell Community Health Center and Anthony Nganga a self-employed architect, addressed the issues facing and raised by new comers to the community. Linda was born in Lowell but her parents came her in the 1980s along with thousands of other Cambodian refugees. They found the city very welcoming. She cited as an example of that her father’s (Tim Tou) founding of the Angkor Dance Troupe and all the support that organization has received in the city. Then Linda said that since most Cambodian residents have been in Lowell for 40 years, they are pretty well-established. But they also have a commitment to welcome today’s new comers to the city, and to apply the lessons the Cambodian people learned when they arrived here, but to make things happen faster. Anthony explained that he was born and raised in Kenya and has lived in the United States for 14 years. At first, he worked for an architectural firm in Andover but eventually went out on his own. He praised E-for-All for helping him launch his own business. He said that everyone he has encountered has been warm and welcoming. 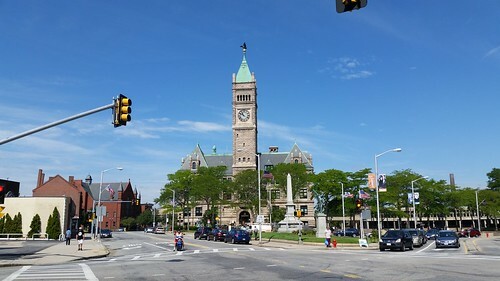 He did observe that Lowell devotes a considerable amount of attention to its downtown but should strive to give equal attention to the neighborhoods, especially to small businesses located there. He said small businesses do much to support the local economy. Both Anthony and Linda observed that the term “new comers” doesn’t just apply to people coming here from overseas, that many people already living in the United States relocate to Lowell. If Lowell wants to grow, it must continue to attract new people from all over but to do that, the city must be welcoming to all who come here. One final observation was about people who do arrive from overseas. Many have limited language skills and limited technological abilities. So much of how we interact with government and the rest of the world is done online, that people in this category are at a distinct disadvantage. Businesses, service providers and government entities should all keep that in mind and make appropriate accommodations so that all have equal access. The final two-person panel was Geoff Foster of UTEC and Heather Doss of the Eliot Church. They spoke about voting and civic engagement. Geoff opened by stressing the importance of voting. He said all of the eligible young people at UTEC are registered to vote, then he spoke of how regrettable it is that in a typical city election, only 20 percent of those registered to vote participate. Some say that is due to apathy. Geoff believes that while apathy plays some part, it is by no means the dominate reason for people not participating in local elections. As for how to increase participation, he believes the early voting, especially when it is done in places where communities that have historically low levels of participation in city elections congregate is a great place to start. He also believes that giving out stickers to those who vote, as simple as it seems, creates a culture that promotes voting. He suggested that the city government launch a citywide civic engagement and voter activation initiative. Heather said that many people feel that their vote doesn’t matter. One reason for that is that the members of the city council have not reflected the makeup of the community. She said it is important to make diversity part of city government and not just an element of cultural events. She is hopeful that the current lawsuit pending against the city for alleged violations of the federal Voting Rights Act will lead to a more equitable system of elected representation. This was an excellent forum that raised many important issues. It was attended by more than 100 people including Mayor Bill Samaras and councilors Vesna Nuon, Ed Kennedy and Karen Cirillo. City Manager Eileen Donoghue was one of the introductory speakers. She said that she had directed a number of staffers from the city’s Planning and Development Department to attend the forum. Also in attendance were dozens of graduates of the Public Matters program who are involved in all aspects of city work and city life. 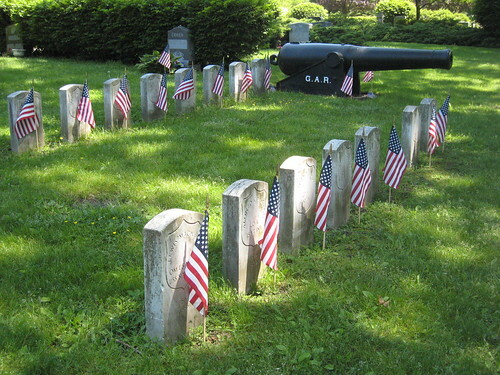 Lowell Cemetery Memorial Service: Next Sunday, May 20, 2018, the Lowell Cemetery will hold its annual memorial service which will begin at 11:30 am with a procession from the Knapp Avenue entrance to the Grand Army of the Republic lot where a speaking program and patriotic activities will take place commencing at noon. The event will culminate with the arrival of a U.S. Army helicopter which will land in the cemetery and remain on the ground for public viewing. Also participating will be many local veterans groups, the Lowell High band and JROTC detachment, Civil War reenactors, and a number of antique military vehicles. The event is free and open to the public. Book Sale: The Friends of the Pollard Memorial Library will hold their annual book sale on Friday, June 22 from 10am to 5pm and on Saturday, June 23 from 9am to 2pm. The Friends are also seeking donations of books for the sale. Beginning on Saturday, April 28 and on every other Saturday up until June 16, people may drop donations of books off at the library’s ground floor community room from 10am to 1pm. Check out the Friends website for more information. KhmerPost USA annual gala: The KhmerPost USA newspaper will hold its 11th Anniversary Gala on Friday, May 18, 2018 from 5:30pm to 10pm at Lenzi’s at 810 Merrimack Ave (Route 110) in Dracut. This event commemorates Asian Pacific American Heritage Month and celebrates the diversity of Asian cultures. This year’s honoree is Lowell Community Health Center CEO Susan Levine. For more information about the event, visit the KhmerPost USA’s website. North/South Rail Link Town Hall: A panel discussion moderated by former Governor Mike Dukakis on the benefits of a rail link between North and South stations in Boston will be held in the Mayor’s Reception Room of Lowell City Hall on Wednesday, May 23, 2018, from 7pm to 8:30pm. The event is free and open to the public and will be hosted by Mayor Bill Samaras. For more information visit the North South Rail Link website. Migrant Quilts at the Quilt Museum: The New England Quilt Museum at 18 Shattuck St in Lowell has opened a major exhibition called Beyond the Boarder Wall: The Migrant Quilt Project. 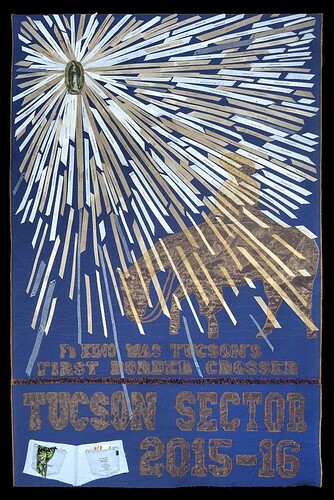 This exhibit is a collaborative effort by artists who have used clothing and other materials discarded by migrants in the Arizona deserts to make quilts that commemorate the hundreds of migrants who have died there. The Lowell exhibit, which runs until July 15, was featured in a recent Associated Press story that ran in major newspapers across the country including the Los Angeles Times, the Washington Post and the New York Times. Third CD Candidate Forum: On Sunday, June 10, 2018 at 2pm at the Lowell High School Auditorium, the Kathy Reticker Forum for Children and Families will host a forum for the candidates running for Congress in the Third District. The forum will focus on issues affecting children and families. Paper Lanterns Update: On August 6, 1945, the United States dropped an atomic bomb on the Japanese city of Hiroshima. Thousands of Japanese died in the blast and from the radiation. So did 12 American prisoners of war held captive in the city. One of them was Normand Brissette of Lowell, Massachusetts. Several years ago, Barry Frechette with the help of Brissette’s family, produced the award-winning documentary, Paper Lanterns, which told the story of the American POWs. 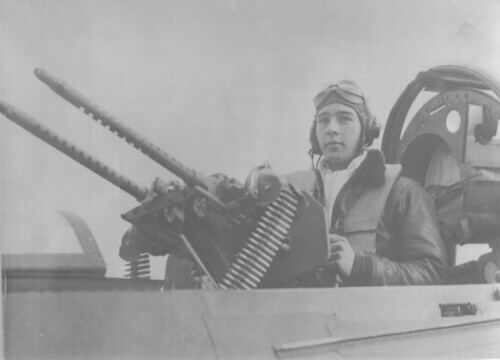 One of the main characters in the film was Shigeaki Mori, who as a young teenager survived the blast, and who devoted the rest of his life to preserving the story of the American POWs. When President Obama visited Hiroshima in 2016, he embraced Mr. Mori and thanked him for his lifelong efforts on behalf of the deceased American service members. This May, Mr. Mori, now 81 years old, will visit the United States for the first time. One of his stops will be in Lowell, most likely on Memorial Day. This article shares some of the background of Mr. Mori’s upcoming visit. Please watch for further details on this important occasion. 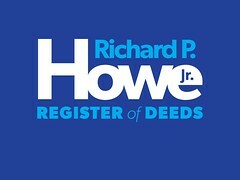 Please help my campaign for reelection as Register of Deeds by following this link and “liking” my Facebook page.